Last Updated: November 14, 2018 · Published: October 8, 2018 By: Asian Caucasian 16 Comments This post may contain affiliate links or sponsored content. Who loves hummus everything? I do, I do! 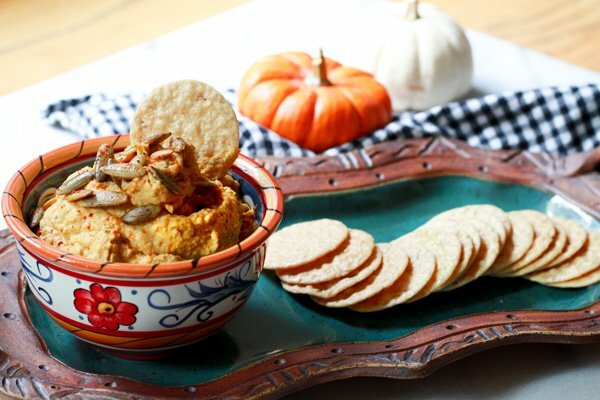 So, why not tap into the flavors of fall with this tasty Savory Pumpkin Hummus recipe? It’s beyond easy to make, NO cooking required! Only 10 minutes to a quick appetizer dip that’s perfect for holiday entertaining. Seriously folks, I made this using a cup of organic pumpkin purée (I like the Trader Joe’s brand), a can of chickpeas, some tahina paste, garlic, a dash of honey, and sriracha seasoning for a little kick. Throw it all into a food processor and pulse until smooth. This pumpkin hummus is creamy and oh so tasty! Serve with your fave crackers, chips or fresh veggies. YES, please! Smooth and creamy, this Savory Pumpkin Hummus is the perfect appetizer for holiday entertaining! 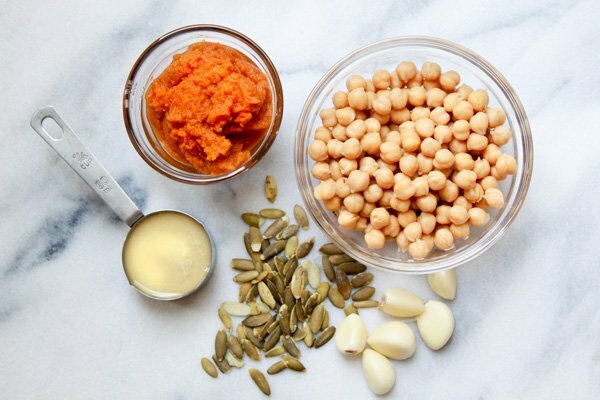 Organic pumpkin purée, chickpeas, tahina paste, garlic, honey, olive oil, and sriracha seasoning are all that’s required for this Savory Pumpkin Hummus recipe. SO beyond easy! Pulse all of the ingredients together in your food processor and this smooth and creamy hummus dip will be the hit of the party! 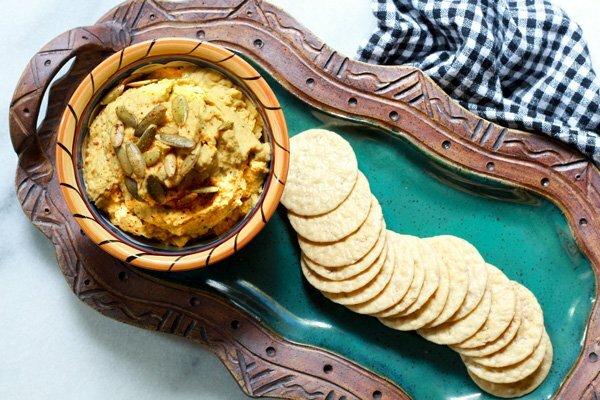 Serve this Savory Pumpkin Hummus dip with your favorite crackers, chips, or fresh veggies! Garnish with oven-roasted pumpkin seeds. This Savory Pumpkin Hummus is so easy to make and tastes delicious with chips or veggies. It’s the perfect appetizer for fall! 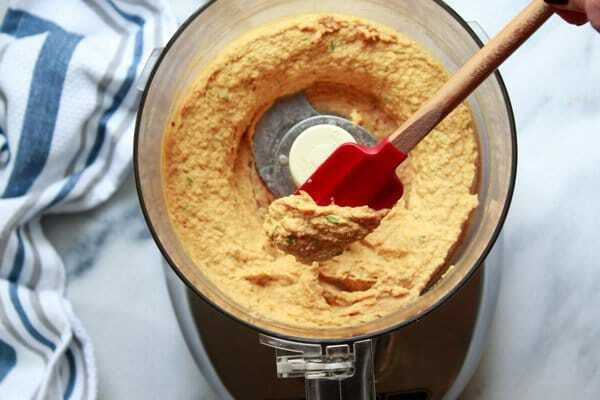 In a food processor, add the garbanzo beans, pumpkin purée, and tahina paste and pulse until smooth. Add in the garlic, honey, sriracha seasoning, and cilantro and pulse another 20 seconds. From the top of the processor, pour in the olive oil and pulse until puréed and hummus is a creamy texture. Taste for seasoning and add a pinch of salt and pepper. When ready to serve, drizzle with olive oil if so desired and top with toasted pumpkin seeds for garnish. Serve hummus with your favorite crackers or fresh cut veggies. 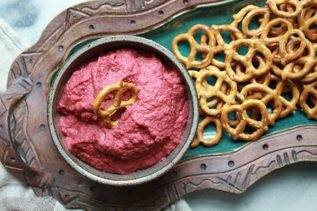 If you liked this recipe, try our Easy Red Beet Hummus. Love the addition of the cilantro to this! How unexpected! I bet it tastes amazing. I need to try this month! You will love it, Julie! I’ve made this with butternut squash also. Both are delicious appetizers for the holiday season! A delicious dip – I love that you added sriracha for that kick! I’m sure this would be amazing on some warm bread! Oh yes! Warm bread, carrot and celery sticks, rice crackers… any of these will work just fine! Pumpkin hummus sounds so so delicious and flavourful. I am totally loving the addition of pumpkin. Perfect autumn dish to enjoy…. Thanks, Geetha! 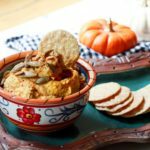 I think you will enjoy this autumn pumpkin hummus! Goes great with pumpkin chips from Trader Joe’s! I love the idea of adding pumpkin to hummus at this time of year. Perfect! Such a great flavor profile for your holiday parties! I make this with butternut squash as well. Hope you enjoy, Amanda! Oooh! I have a huge love for hummus! I have never even though about adding pumpkin! Yum! Beth, you will love the addition of the pumpkin! Such great flavors for this time of year and great as a starter for your holiday party! I can’t wait to give it a try! Looks delish! Thanks, Toni! It’s such a great twist on the traditional hummus recipe! The pumpkin really adds a nice flavor. Perfect for game day, Amy! 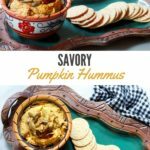 It’s a great twist on the traditional hummus recipe and ideal for a fall appetizer! Pumpkin sounds like a great addition to hummus, turning it into a lovely seasonal snack for autumn. Thank you, Lucy! 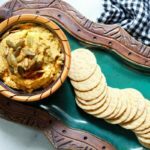 This Savory Pumpkin Hummus is super easy to make and a nice twist on the traditional hummus recipe.